Antonio Guterres disgraces the office he holds, appointed to serve US-led Western interests. He consistently fails to observe UN Charter principles he’s sworn to uphold – notably preserving and protecting human rights, supporting world peace and stability, denouncing wars of aggression, and respecting fundamental international laws. He one-sidedly supports Western and Israeli interests, failing to do anything to help long-suffering Palestinians, notably beleaguered Gazans. In response to bloody Friday, Israel mass-murdering 17 Palestinians, wounding over 1,400 others, at least 20 with life-threatening injuries, preemptive Israeli aggression by any standard, Guterres failed to denounce what happened. He failed to demand Israel be held accountable for a bloody day of Nuremberg-level high crimes. Instead through his spokesperson, he expressed hollow deep concern, disgracefully calling for an independent investigation into what’s self-evident. Any so-called probe into Friday’s violence will be obstructed and whitewashed by Israel, a worthless undertaking. 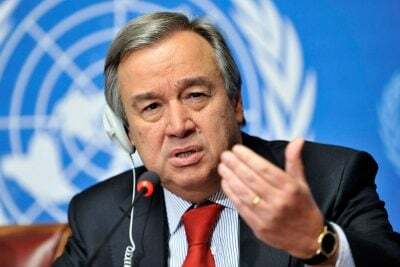 Guterres’ call “to refrain from any act that could lead to further casualties and in particular any measures that could place civilians in harm’s way” ignored reality. Palestinians throughout the Territories are in harm’s way every day, brutalized by a merciless occupier, gunned down in cold blood, arrested and detained on any pretext, brutalized in captivity, denied internationally guaranteed human and civil rights. Since taking office in January 2017, Guterres failed to condemn Western and Israeli high crimes, failed to demand long-ignored accountability, failed to support victims of their naked aggression. He absurdly called for “revitalizing the (no-peace) peace process” – dead-on-arrival each time initiated, notably since Trump’s Jerusalem declaration, driving a stake through the heart of conflict resolution, making it less attainable than earlier. Guterres should have issued a strong statement similar to the above remarks. Instead, he sided with Israeli mass-murder by failing to condemn it, calling only for a meaningless investigation, accomplishing nothing for brutalized Palestinians if undertaken.